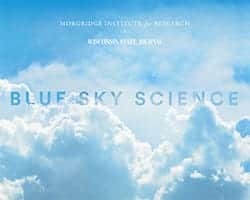 News & Stories > Blue Sky Science > How is a gummy bear made? Gelatin is the basis of what makes a gummy bear a gummy bear, but we first start with sugar, corn syrup and water. We have to use water to help the sugar dissolve, but then heat the mixture to about 240 degrees to boil off the excess until the mixture is only about 12 percent water. We then add gelatin and dissolve it into the mixture. Gelatin comes from the hooves and skin of pigs or cows and is basically collagen broken into smaller molecules. Think of a tough or grisly meat steak— that’s collagen. When you add heat, like putting meat in a crockpot for an extended period of time, the collagen breaks down and is easier to eat. One interesting property of gelatin is that it’s thermoreversible, meaning that heat can turn it back into a liquid. If you put a gummy bear in the microwave, you’d see this in action and the gummy would turn liquid. When it cools down again, it resets back into a squishy gel.